You can compose your graphics from multiple elements. Moving or copying these graphics might be difficult, but to simplify these operations you can group multiple objects together so you can use them as a single unit. Select the objects to be grouped and click on the icon in the toolbar (or select it from the menu Edit). The objects are now grouped and behave as one object; the group can be moved, resized, rotated, skewed, etc. This function is used to divide grouped objects back into independent elements. 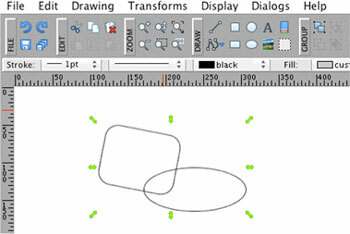 Select the group of objects and click on the icon in the toolbar (or select it from the Edit menu), and the object will divide into its elements. With this function, you can work with individual objects that are grouped without needing to ungroup them first. Therefore, you can work with each object individually without ungrouping. 1. Select a group of objects. 2. Click on Edit (shortcut Ctrl+E) and select Enter group (or use the appropriate icon in the GUI Toolbar). 3. Now you can work with any object in the group individually. Once you have finished working with the objects in the group, you can leave the group by clicking on Edit -> Exit group (or shortcut Ctrl+Shift+E or by using the appropriate icon in the GUI Toolbar).